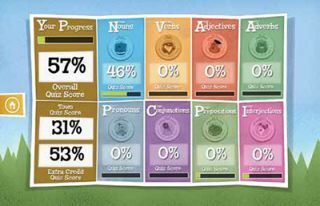 Quality and Effectiveness: Grammaropolis was created by a teacher as an alternative to teaching the eight parts of speech through boring worksheets and drill-and-quiz lessons. Each part of speech (adverb, verb, pronoun, adjective, preposition, noun, conjunction, and interjection) is represented by a cartoon character. Each character was developed and animated by Powerhouse Animation with Web site and mobile app design by Bouncing Pixel. Every character has a personality that fits its role in the language. For example, adjective is an artist and action verb wears a cape. Creative Use of Technology: Each part of speech is taught with song, video, and click-and-choose quizzes. Every section is bright, cheerful, and very entertaining. Parents’ Choice Award-winning children’s musician, Doctor Noize, has created a full-length music album including a song for each individual part of speech. Each part features a different musical genre. Grammaropolis app is available for both iOS and Android. (NOTE: This reviewer evaluated the iOS version.) The free version is limited to the noun section, and the links to games and music direct the user to the iTunes Store. The iPad version of the Curriculum Map is laid out like a map rather than in a line. The multiple-choice quiz buttons in the iPad version are also bigger and more colorful. Otherwise, students will be able to transition from PC to iPad version smoothly. Suitability for Use in a School Environment: Grammaropolis is aligned with both national Common Core standards and Texas Expected Knowledge and Skills Objectives for grades K-6. The presentation blends traditional lesson and quiz teaching with song and video and addresses multiple and varied learning styles. Progress along the map alternates between both creative and traditional content, but students can choose their own paths or revisit sections freely. Teachers can view students’ overall progress, as well as their progress in each section. • Grammaropolis combines traditional English grammar instruction and quizzes with highly entertaining videos and songs to engage students and address multiple learning styles. • It was created and tested in the classroom using an advisory board of standards-compliant curriculum experts, elementary and middle school teachers and administrators, and publishing and entertainment industry professionals. The graphics, songs, and videos are entertaining and effective. • Students can log in from anywhere, so teachers can use it in the classroom, for whole-group or individual instruction, or as a homework assignment.